Born on 26 November 1893 in Omagh, Ireland - son of Hugh and Margaret Campbell, Belfast, Ireland - nephew of Miss Jane Campbell, Lisnemallaid, Omagh, Ireland - enlistment records provide the following: trade as bookkeeper, single, joined the Governor General's Foot Guards on 12 January 1915, no previous military service, Presbyterian, height of 5 feet 9 inches, chest of 37.5 inches fully expanded, fresh complexion, blue eyes, light brown hair. 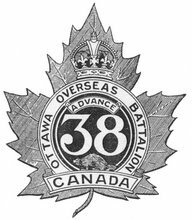 Joined the 38th Battalion, CEF, in Ottawa, Ontario, on 26 February 1915 (number 410245) - served with the 38th Battalion during its period of garrison duty in Bermuda - landed in France with the 38th Battalion on 13 August 1916 - killed in action on 9 April 1917 - name inscribed on the Vimy Memorial, France. (Updated with a photo of Sgt Campbell's inscription on the Vimy Memorial that I took in August 2012).